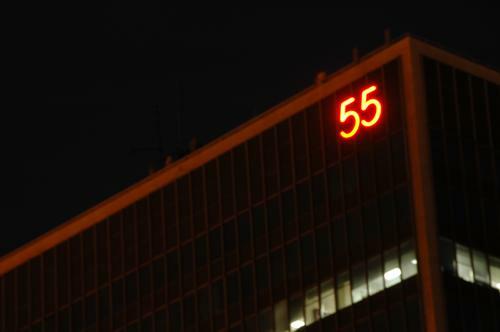 55 Public Square (formerly known as the Illuminating Building, after the Illuminating Company, the building's primary tenant) is a 22-story skyscraper located at number 55 Public Square, the town square of downtown Cleveland, Ohio. Designed by Carson Lundin & Shaw Architects, it is 300 feet (91 m) tall, was completed in 1958, and was the first new skyscraper built in Cleveland since the Terminal Tower complex was completed in 1930. It was also the first tall International Style building in the city and the first to use a reinforced concrete frame. The consulate general of Slovenia is located in the building. Like other modernist office towers of its time (including the Seagram Building, built in the same year), it is set back from the street by a small pedestrian plaza, which is interrupted only by a single-story restaurant at one end. The tower was initially intended to employ a steel frame, but reinforced concrete was used for the upper 12 floors because of a steel shortage. A seven-story parking garage adjoins it on the north side. The building was built at a cost of $17 million, and was first owned by Vincent Astor and the Brooks-Harvey Co. of New York. Willett Properties LLC.